This will be brief because it’s J’s birthday and I still have presents to wrap. But the cakes (yes, cakes!) are baked, the birthday granola (by special request) is cooling, and we’re ready to celebrate another sunny day and wonderful year together. Whatever you’re celebrating this weekend, this is the season for enjoying the sunshine and hanging out with friends, and where there are friends hanging out, there are bound to be snacks. These pecans are sweet and snappy, with a little something special from the fragrant woodsy rosemary. (I won’t tell anyone if you hide a few away in your cupboard to throw in a spinach salad with strawberries and goat cheese later this week. In fact, I’m going to go do that now.) The recipe below is a happy love child of this one and my favorite olive oil granola. Rosemary Candied Pecans: In a saucepan, warm 2 Tb. olive oil with 2 Tb. demera or brown sugar and 1/4 c. maple syrup, stirring just until the sugar melts. Stir in 1 tsp. minced fresh rosemary (for a subtle flavor; you could use up to 2 tsp. for a more pronounced rosemary flavor), 1 tsp. kosher salt, and 1 lb. pecan halves. Mix until well combined. Scrape the nuts and liquid onto a rimmed sheet pan (it will look like a lot of liquid; don’t worry) and bake for 15 mins. at 375, stirring occasionally. Remove from oven and sprinkle with a few more pinches salt (use fleur de sel or another nice flaky salt if you have it). Continue to stir occasionally as the nuts cool so they don’t candy themselves right to your baking sheet. When they are completely cool, store in an airtight container. You may find yourself in despair when you see what a mess your pan is, but give it a 5-minute soak and the sugar will dissolve away. This entry was posted in DIY, Easily Multiplies to Feed a Crowd, Food, Recipes, Snacks and Apps and tagged appetizer, cooking, DIY, family, happy hour, homemade, lifestyle, nuts, recipes, snacks on May 27, 2012 by emmycooks. Thanks for this! I’ve bookmarked it as a gift idea. It sounds addictive. These look absolutely delicious! I wasn’t sure until you mentioned using them on a salad and now I can’t wait to try them! Love the combination of flavors! Happy celebrating!! Mmmm. I adore candied nuts and savoury ones too. I’ve used rosemary before, but in a savoury recipe. I must add this one to my repertoire! Love this flavor combo and candied pecans are good on or with anything! Awesome Emmy! I was jusstttt thinking about making some nuts with rosemary! Great idea! 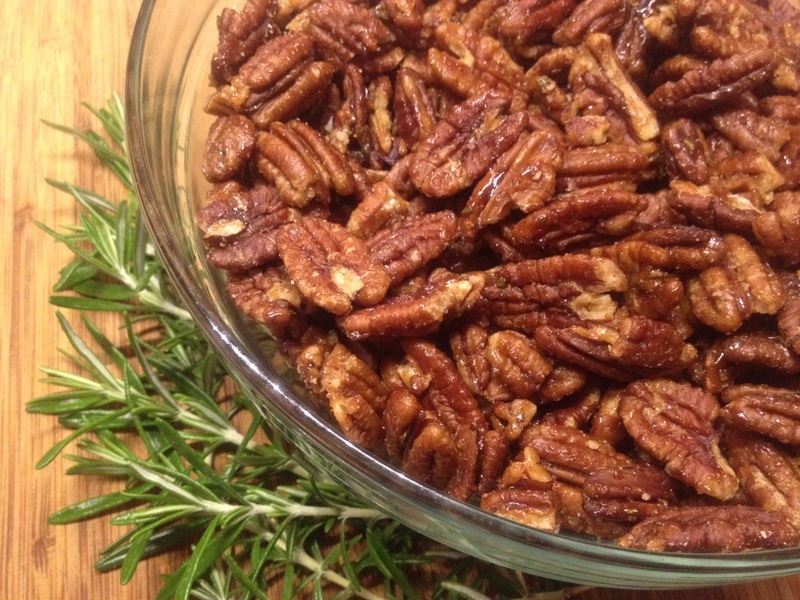 I love pecans and rosemary together! I was just about to say that it reminded me of the Union Square Café’s Bar Nuts, but then I say the link. The nuts are yummy, yummy and I bet these pecans would go great with the strawberries and goat cheese. Thanks for the tip about cleaning the pan too! Very important. Yup, those Union Square Café bar nuts have made many appearances at parties at my house! This looks like a great variation. We made a sort of Indian flavored nut mix this weekend. Yum. Note to self: Make these for hubby’s stocking. What a good idea. They would make super easy and lovely little holiday gifts all around!